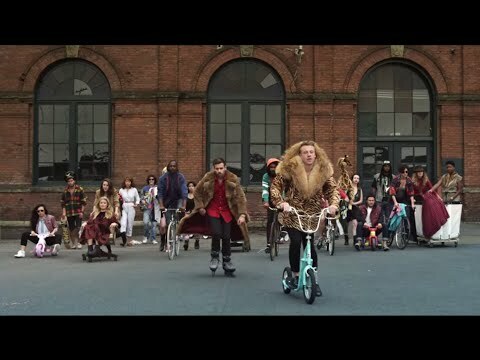 "Thrift Shop" is a song by American rapper Macklemore and producer Ryan Lewis. It was released on August 27, 2012 as the fifth single from their collaborative debut studio album The Heist (2012) and features vocals from Wanz. Despite being released on Macklemore's independent label, with distribution by ADA, the single was a sleeper hit, with unexpected commercial success, peaking at number one on the Billboard Hot 100, while selling 7 million copies in total. The song also reached number one in the United Kingdom, Republic of Ireland, Canada, France, Denmark, Netherlands, Australia and New Zealand. Furthermore, the song has garnered more than 400 million views on YouTube. The song is the first independently distributed title to top the Billboard Digital Songs since "We Are the World 25 for Haiti" in February 2010. It is also only the second independent song in history to achieve the number one spot on the Billboard Hot 100 chart, nearly 20 years after Lisa Loeb's "Stay (I Missed You)" in 1994. A music video was released to accompany the song's release on August 29, 2012. It was used in the trailers for the films Pain & Gain and The Internship. The song took the #1 spot in the Triple J Hottest 100 countdown of 2012.